Be the first to share your favorite memory, photo or story of Lue Vina. This memorial page is dedicated for family, friends and future generations to celebrate the life of their loved one. 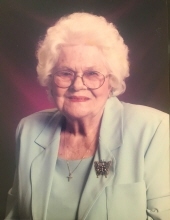 Lue Vina Futch Ferguson, 94, widow of William H. Ferguson, Jr. died Monday, December 24, 2018. Mrs. Ferguson was the daughter of the late Montie Gee and Ina Jessie Jenkins Futch. She was a homemaker and active member of Mt. Arnon Baptist Church. She was a loving mother, grandmother, great-grandmother and great-great grandmother. Funeral Services will be held 2:00 PM, Friday, December 28, 2018 at Mt. Arnon Baptist Church with Reverend Gene Long and Reverend Mike Catoe officiating. Interment will follow in the church yard. great-grandchildren; two great-great grangchildren;one son-in-law, Tony Fleetwood; many nieces; nephews; and their children. She was predeceased by one son, Michael Randolph Ferguson; one daughter, Betty F. Fleetwood; one granddaughter; Tara Ferguson Snider; one grandson, Tony Dean Fleetwood, Jr.; and one son-in-law, Bobby Williams. Memorial Contributions may be made to the Mt. Arnon Baptist Church, 783 Parkwood Terrace, Allendale, SC. 29810. To send flowers or a remembrance gift to the family of Lue Vina Futch Ferguson, please visit our Tribute Store. "Email Address" would like to share the life celebration of Lue Vina Futch Ferguson. Click on the "link" to go to share a favorite memory or leave a condolence message for the family.